So Verne, what's this job you have for me? I need to update my post with pictures. But what i did is cut out backbone and stringers, all of which was hogged and in poor shape. And replaced with new straight timber. This corrected 98% of the hogg. I m now workinf on fairing the rest of the waves out of the bottom. I've started this seasons work on my Sea Lancer. Currently refastening the hull, which consists of tightening all the Silicon bronze plank bolts/nuts (not screws) and replacing all the plank to frame screws. Not sure if I will fix (via replace) the port side plank ends this season or just fill them in. Note the car rollers that she is sitting on. Wish I thought to do this 2 years ago! 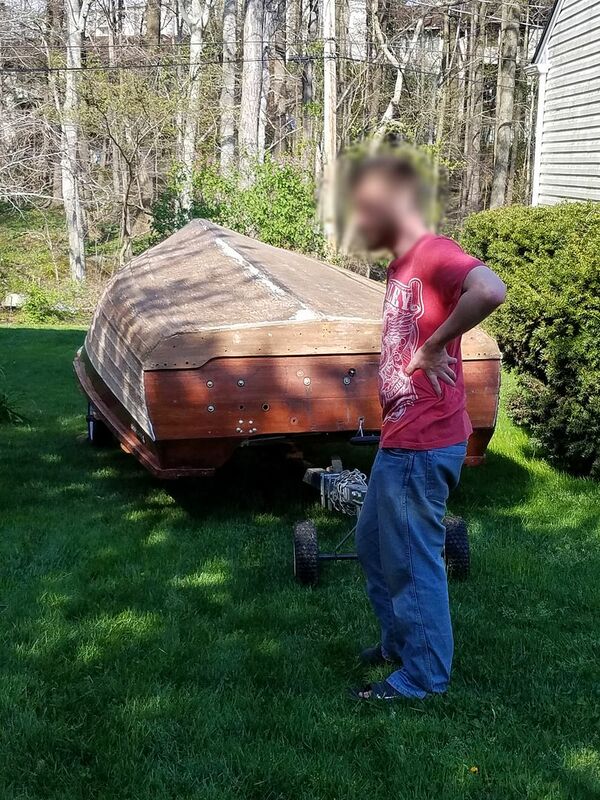 Makes it incredibly easy to move the boat around. Even if you just want to move it a tad for better light, it's just an easy push. You don't even need to put your tools down. Hello again everyone - been awhile, but I have indeed been finding a few minutes here and there to work on the boat. I'm about two thirds the way through refastening the hull. 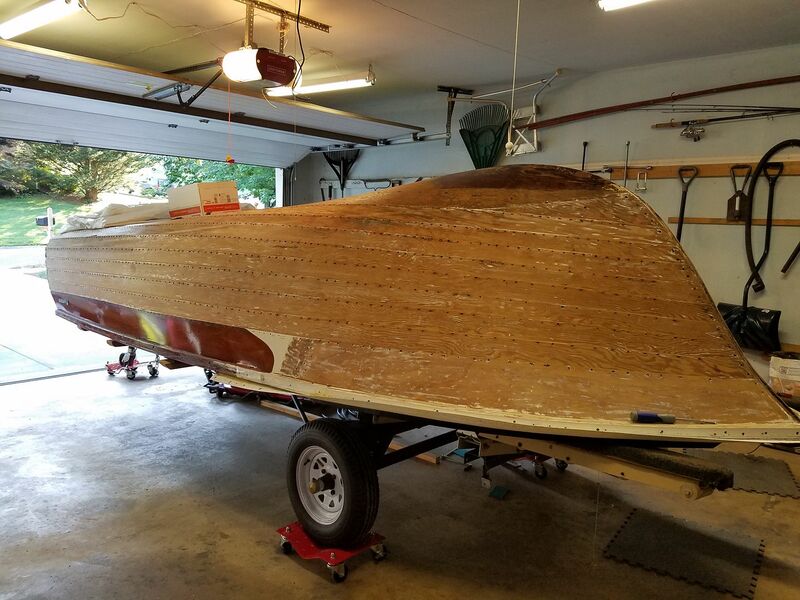 I am tightening every bolt and replacing every plank to frame and plank/garboard to transom screw with Frearson drive silicon-bronze, cut thread screws of once size up, same length (don't want to come through the frame on the other side). Frearson drive is orders-of-magnitude better than Phillips or slotted drives. Even though silicon-bronze is a much softer metal than Stainless Steel, after 300+ screws I've only stripped the heads of 2 or 3. For the screws, I am drilling out the hole to the right size for the new screw, being careful not to go any deeper (as best I can), and resizing the countersink to the right size for the head of the screw, again trying my best not to go any deeper. The screws are tightening down nicely, indicating that the frames are in good shape. Up near the sheer they are grabbing like Hercules! I'm now into the planks at the turn of the bilge and the screws are still tightening down nicely. I am also replacing bolts as needed. The bolts have a shallow slot and are very easy to ruin. If ruin it, I am replacing it with silicon-bronze, slotted drive, cut thread bolts of the same size. I'll have to cut them to length once she is upright. Tightening the bolts was easier than I thought it would be. As much as I have grumbled about the guy that decided to paint the interior of the hull, that paint has served to hold the nuts so that for the vast majority of the thousands I didn't need someone on the inside capturing the nut while I tightened them. Fifty or so I needed my agile son to sit under the boat and capture the bolts. I've been able to put two or so turns into every bolt, being careful not to over tighten so as to avoid ruining the fare of the plank, as well as avoid separating the plys of plank. When installing the new screws (or tightening the bolts) I am using a power driver to put the screw in, but tightening it down by hand only (a tip from Lou, of Tips from a Shipwright - google him up - awesome stuff). A ratcheting screw driver makes this much easier as you don't have to lift the bit off the screw/slot. I was surprised at how deep and inconsistently all the bolt/screw heads were countersunk when she was built. Way more than I would have. Maybe they needed a deep countersink for the fillers used at the time. I suppose it matters not at all. She's held together for 55 years. Sourced my screws/bolts from Boltdepot (.com). Great selection, fast response to questions I e-mailed to them, and fast shipping; only a few days from click to doorstep. 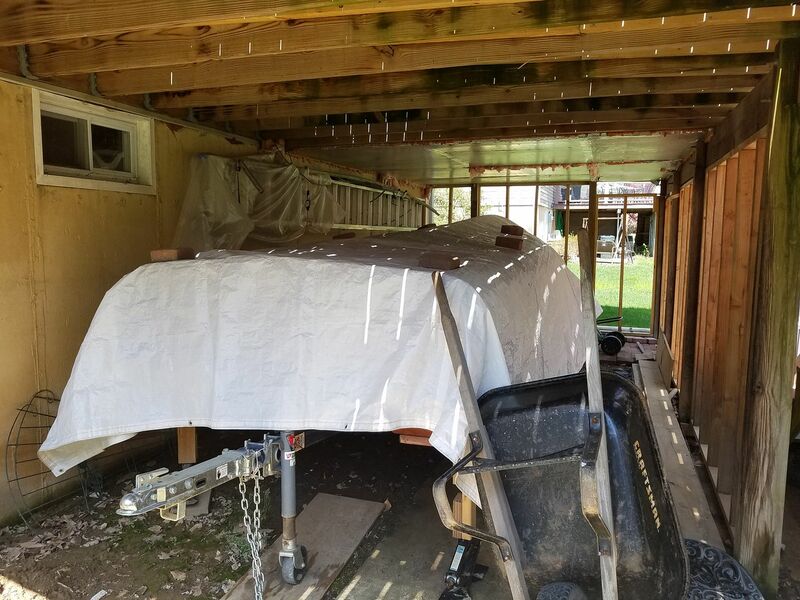 Kept her under the deck for the winter. Had to wait for a nest of Rens to learn to fly before I could bring her around. And the kid, monologing about how there must be a better way to move the boat (I was pushing from the bow. Sorta.